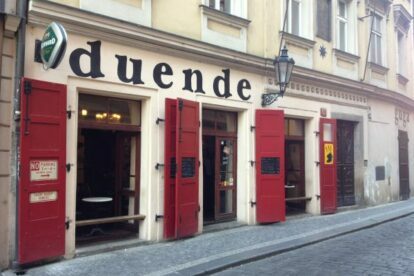 If I am in the city centre near Karlův most (Charles bridge) and want to have a beer on tap or coffee, this is the place. At first sight it’s a slightly dark bar, decorated with various photos and movie posters, with the possibility of opening glass windows, which in the hot summer is appreciated by all mixed-aged locals. Beer on tap is Pilsner Urquell and Bernard and the best place to enjoy it is in the box seat by one of the windows. If you’re not in the mood for beer I suggest you to try malinovka (= raspberry lemonade). If I am hungry, there are lots of small meals available, excellent especially served with beer. I suggest you try the daily soup. Once in a while there are also some concerts held and although the place is very crowded during these occasions, the atmosphere is always friendly.